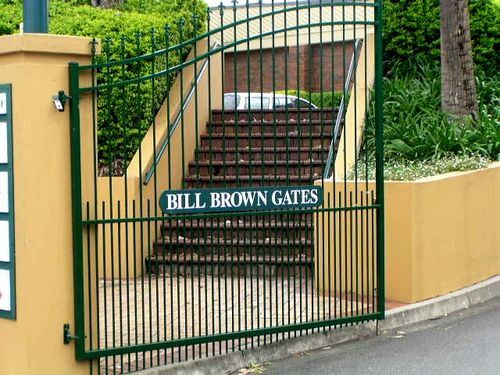 Gates commemorate cricketer Bill Brown. An outstanding opening batsman, Bill Brown, who died at the age of 95, belonged to that generation of Australian cricketers who had their careers interrupted by World War Two. Touring to England for the first time in 1934 and ending his top flight international career with the Invincibles in 1948. Brown played 22 tests for his country, averaging nearly 47 with the bat, and outlived his contemporaries and became Australia's oldest surviving Test cricketer. Bill Brown died in 2008.